marketing | Digital Marketing, Poetry, Reviews, Philosophy, Sports & Tales by Joe Wooldridge. Thanksgiving is nearly upon us and we are celebrating our 10th year of being in business and invite you to join us! To join MyJoeCard at our 10 year celebration, call 913-271-2955 and mention this email. 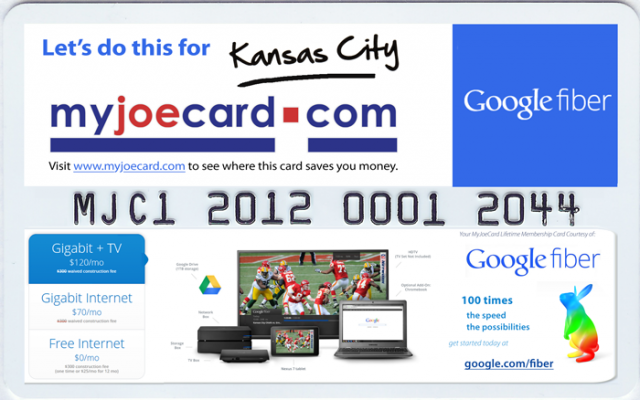 In 2004, we launched www.myjoecard.com and began building a ‘Go Green’ and ‘Shop Local’ network of Kansas City area businesses. In the last decade we have grown to 100’s of business members and many tens of thousands of cardholders. To celebrate, we are offering our best on marketing for Kansas City businesses! We love Kansas City and we are grateful to grow and become a part of the community of greater Kansas City through partnering with local charities, non-profit organizations and also participating in many regional events with area businesses and attractions. The Silicon Prairie has come a long way in the last 10 years. The KC online community has grown and blossomed tremendously. Where once we were just beginning to leave dial-up connections behind – we now are the envy of the World as Google Fiber has made us the starting point for their fiber-optic network delivering Gigabit Internet speeds! We have a lot to be thankful for and we have decided to bundle together a package of our best and put it together at a better rate than we ever have before. This package provides your business listing at myjoecard.com (one year), email advertising twice/month (linked with your logo) and 1,000 cards with YOUR logo on them. We would love to have your business aboard and we look forward to being your #1 Marketing ROI. 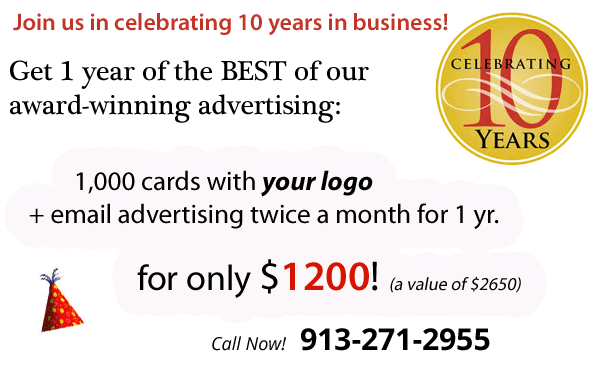 Drop a line to joe@myjoecard.com and mention that you want the 10 year anniversary advertising package.